When I purchased Rescue Me, Maybe by Jackie Bouchard, I had no clue the book would provide such a sucker punch to me personally. I thought I was in for a sweet, humorous read. I got that - plus much more. In the past 18 months, I've lost 3 dogs. I've provided care for my mother and lost her, as well. My husband is now coping with serious illness that impacts every piece of our lives, except, perhaps, the love of our dogs. Rescue Me, Maybe by Jackie Bouchard, is a story about loss and new beginnings. In a strange way, it was as though Bouchard took my own recent life events, gently stirred once and told the story. Reading Jane's encounter with her in-laws over her husband's ashes felt surreal. I had an encounter with my mother's brother that was so similar, it felt eeirie. Rescue Me, Maybe made me laugh. It made me cry. And it left me feeling well satisfied, hopeful, and trying to live life more like my own dogs. All the best book authors are doing book trailers these days! 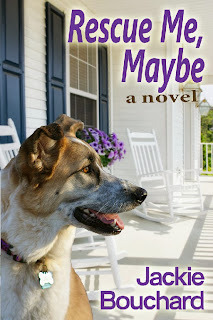 "Rescue Me Maybe" Book Trailer from Jackie Bouchard on Vimeo. If you lost both your spouse and your dog to cancer within weeks of each other, but you were sadder about the dog, would you tell anyone? Maybe your closest friends. Unfortunately, Jane Bailey's closest friends are on the other side of the country. That's where Jane plans to go now that she's free to leave Philadelphia, the too cold, beachless, street taco-deficient city her husband dragged her to six years ago. But with no job prospects in her hometown of San Diego, Jane is roped into helping out temporarily at her uncle's southwestern small-town B and B. 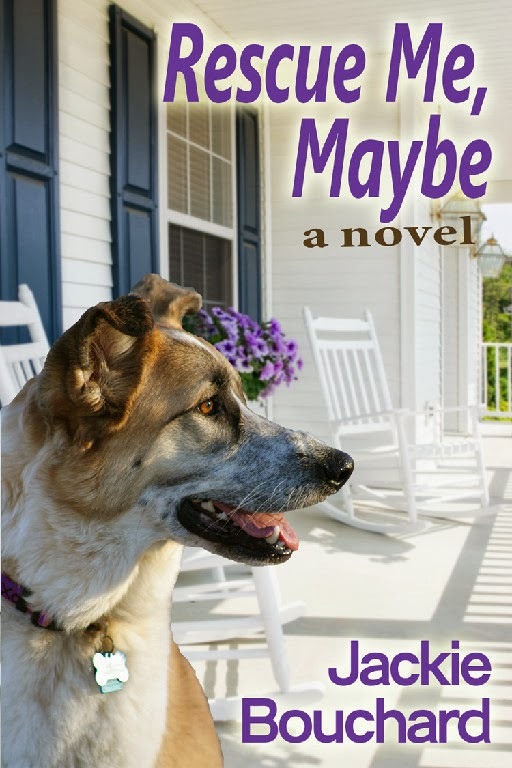 En route to her new role as innkeeper and breakfast chef, she finds a stray at a rest stop. With her heart in pieces from the loss of her dog, she's determined not to let this mutt worm its way into her affections. She's also determined to have next-to-no interaction with the B and B's irritating guests, and the even more annoying handyman who lives next door. Can Jane keep her sanity--and her secret that she's not really a grieving widow--while trying to achieve her dream of getting back to the place she thinks is home? I love the protagonist, Jane. She's what I like to call an honorable person. When the husband she was planning on divorcing falls ill with cancer, Jane keeps her mouth shut, sticks it out until the end and even puts up with a very pushy mother-in-law. Jane is a loner. Though good at taking care of others, she is loathe to speak up for herself. Jane has a kind heart. No matter that her agenda is to get back home to San Diego as soon as possible, she's easily roped into helping out her aunt and uncle at their Arizona B & B because they really need her. Jane is a dog lover. I keenly felt her loss of her boon companion. I was with her all the way as she figures out her relationship with the dog she rescues at a rest stop. Having had a tripawd dog, I anguished along with her as she makes health care decisions for Maybe. Jane thought she was rescuing a dog. Ha! As happens more times than we humans like to admit, it was the dog doing the real rescuing. With rescue dog, Maybe, as her teacher, Jane learns to open herself to new possibilities and create a nurturing life for herself. What a wonderful read! Bouchard writes with great compassion combined with humor. She deals with issues like death and loss with an attention for the ironic details that made me sigh and, yes, laugh out loud. Along the way, we meet a cast of characters that remain with me even though I long ago finished reading the book. Life is what happens while you're busing making plans. Do yourself a favor and snap up a copy of Rescue Me, Maybe. It's a great read from a woman who is an authentic dog lover and is available in print or Kindle format from Amazon and for Nook from B&N. As an added bonus, Bouchard has pledged 10% of 2013 profits to the Morris Animal Foundation. Jackie used to be trapped in the hamster wheel of corporate America, but she was lucky enough to escape and now fully understands the term "struggling writer." 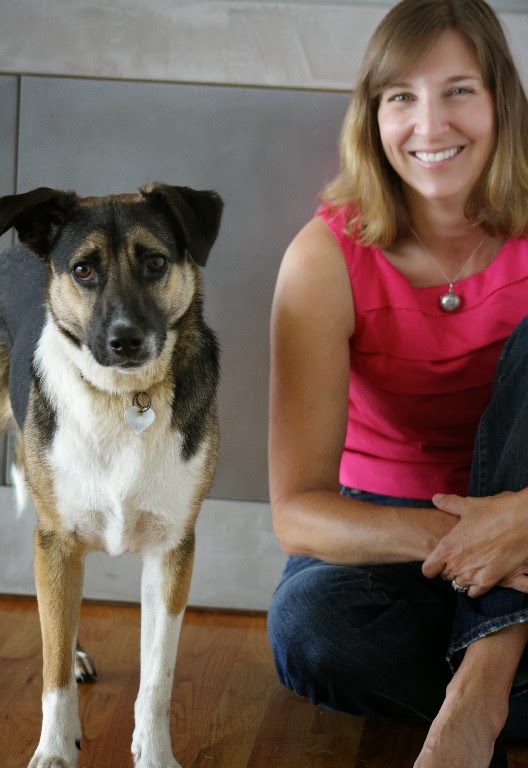 Jackie loves: reading, writing, and, yes, even 'rithmetic (seriously, algebra rocks); professional cycling; margaritas; blogging (she never thought she'd say that, but she does); dogs in general, and her crazy rescue pup specifically; and her hubby. (Not in that order.) Jackie dislikes: rude people and writing about herself in the third person. After living in Southern California, then Bermuda, then Canada, then the East coast, Jackie and her husband settled in San Diego. American Jackie, her Canadian hubby, and her Mexican rescue mutt form their own happy little United Nations. Jackie's debut novel, What The Dog Ate, was followed by Rescue Me, Maybe. Talking Dogs is the official blog of For Love of a Dog Jewelry. I purchased Rescue Me, Maybe for myself and received no compensation for this review other than the personal satisfaction of sharing a very good book with my readers. I just finished the book last night. Loved it! I need to get that book for Mom, I think she is afraid of it because is sounds like it could be a book about her! Great review! I also loved this book and wrote a review of it on my blog today! I wanted to read yours also, and it is really great. I am sorry to hear you have been going through such a rough time....when I was in the middle of the book one of my dogs had developed a limp and it was hard not to panic! We had just lost our other golden retriever to cancer over the summer. It turned out OK this time though, her limp is from arthritis. I hope things turn out well for your husband. I can only imagine how difficult that must be. Sounds like an interesting read. Thanks for sharing! I loved your review of this and I loved this book. I can't say enough about what a great read it was. I really empathized with Jane and immediately was drawn into the book.